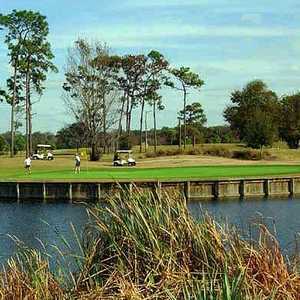 TAMPA, Fla. -- The Tampa Bay region has nearly 400 golf courses spread out over eight counties. Most of the courses are flat, so there aren't a lot of hills to deal with. But they are loaded with water, and that's the defense these par 3s have to make them as tough as any in the nation. Make sure you have plenty of golf balls by the time you get to No. 15 at Pebble Creek. Accuracy is everything at Pebble Creek G.C. Florida golf is mostly called "target golf." There aren't a lot of lay-up areas on the par 3s, but there's plenty of water and sand. The toughest are impossible for some to reach from the tips. Most courses make up for the lack of elevation by using heavily contoured greens, so it isn't enough to hit them. You have to hit them in the right spot. 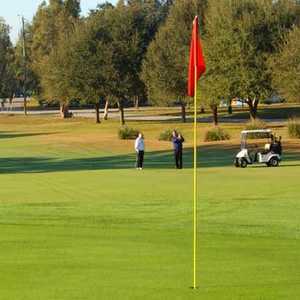 Here are some examples of what makes Tampa Bay-area par 3s some of the hardest in the nation. There's water everywhere on the 15th hole at Pebble Creek Country Club except for the front of the green, where sand awaits. Water and sand might make for a nice beach experience, but getting out of here with par is almost as nice. Water comes into play on 17 holes at Pebble Creek, so make sure you have plenty of golf balls by the time you get to No. 15. At 263 yards, it takes a huge drive just to clear the marsh and lake and reach the 14th green at Heritage Harbor Golf & Country Club. It's one of the longest par 3s in the Tampa Bay area, and there is a wide -- but narrow -- green to hit if you decide to go for it. Also, there is sand at the front and behind the green and, except for a small spot short to the right of the green, there is no bailout. Hitting the bailout is almost harder than hitting the green. The 13th hole at Heritage Isles Golf & Country Club requires a lot of thought. It requires a carry over water to a narrow green, but there is wind to deal with that makes club selection vital. It plays to 235 yards and there's a bunker on the left side of the green, which slopes from back to front. At 239 yards, the eighth hole at Cheval Golf & Country Club is the longest par 3 on the course -- and it plays even longer. There is a small bailout area on the right, but you have to clear a long bunker just to get to the bailout. With two pot bunkers bordering the green and water all the way down the left, it's a beast, but it is sandwiched between two of the easier holes at Cheval. At 134 yards, the 12th at Cove Cay Country Club isn't one of the longer holes, but it is one of the more dangerous par 3s. With traps on the front and the right, and trees on the left, clearing the water forces a carry that makes it a difficult and intimidating hole. There are no options except to hit the green from the tee. The 13th hole at Bardmoor Golf & Tennis Club plays to 225 yards, but there is no margin for error. Hitting it short means water on the right and trees to the left, and there is sand on all sides of the green. It is the No. 4 handicap hole at Bardmoor and, although you can lay-up in front of the green, the green slopes back to front and makes for a tricky chip shot. Rocky Point Golf Course is a muni, but that doesn't mean it doesn't have some teeth. The 16th hole is 190 yards, but there is water down the left and right and the green is tiny. There's sand on the back, so accuracy is key. The first of back-to-back par 3s at Tampa Bay Golf & Country Club, the third is by far the toughest on the course. Playing at 205 yards, it requires a long tee shot over water to a tight green surrounded by sand. The course is tough at the start, but if you survive the third, the next hole is the easiest on the course. Chi Chi Rodriguez Golf Club isn't overly demanding, but the eighth hole is. At 202 from the tips, there is nothing but water down the left side and bunkers that hug the green. It is the No. 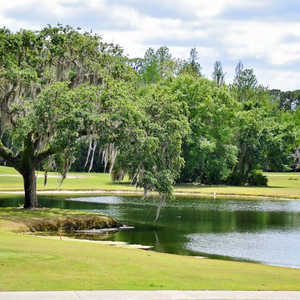 5 handicap hole on the course and is an appetizer to the toughest hole on the track, the 383-yard par-4 ninth that requires a long approach over water that fronts the green.